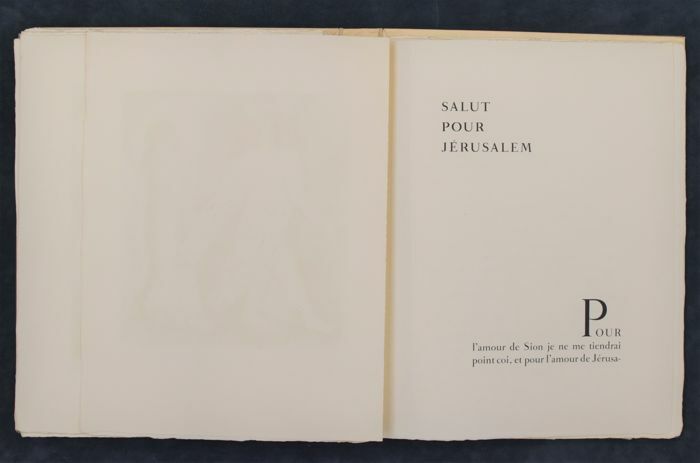 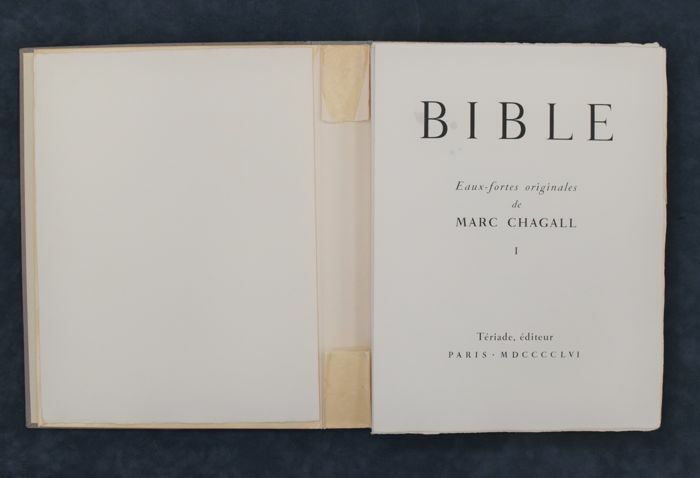 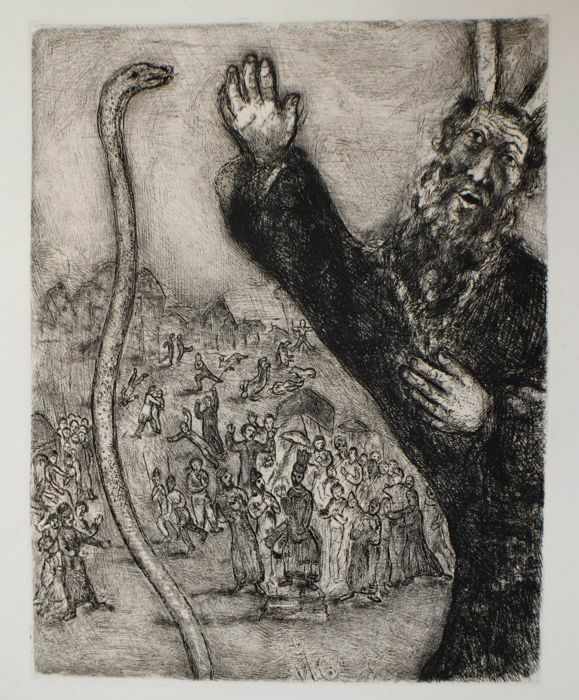 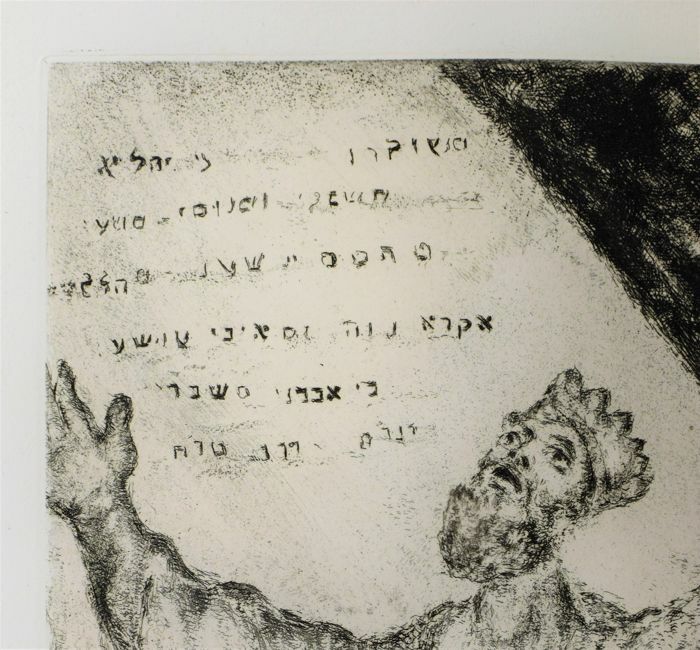 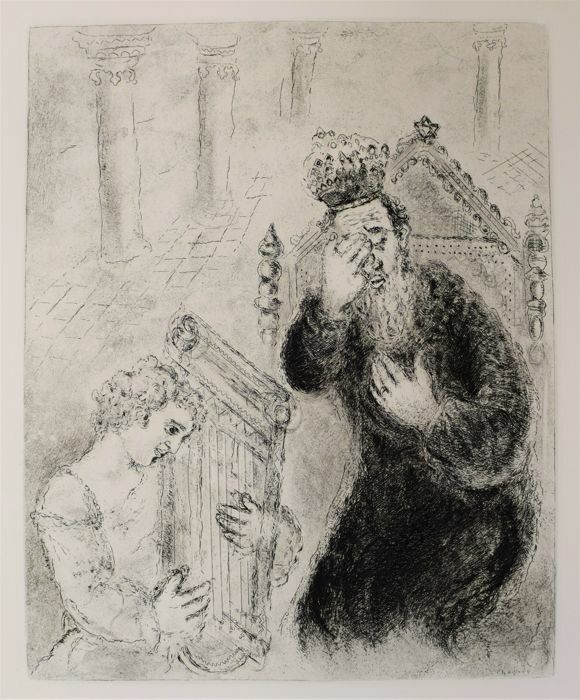 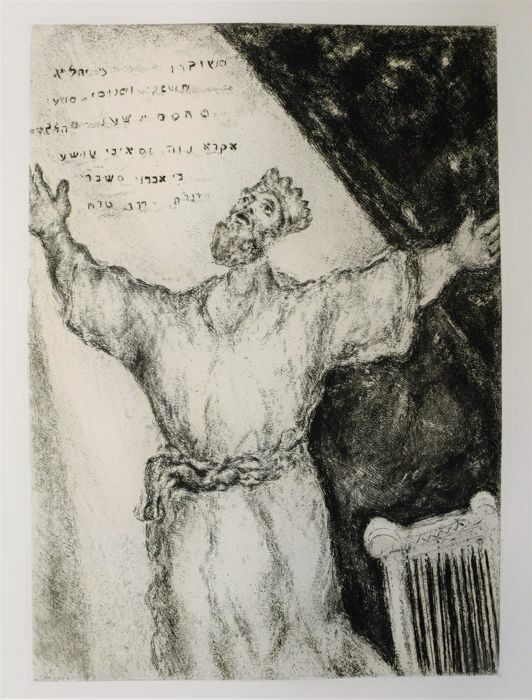 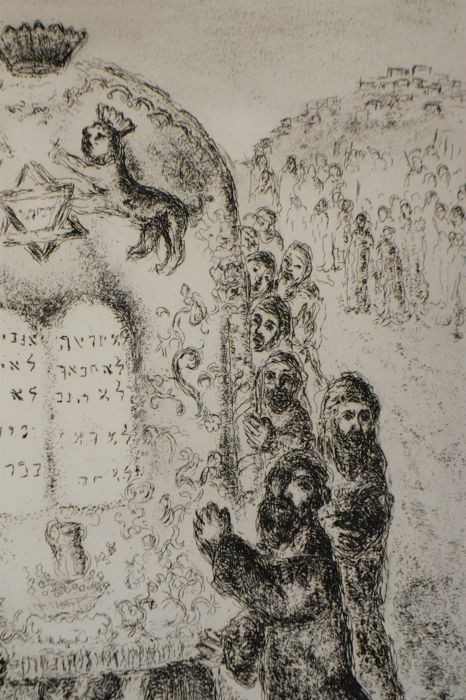 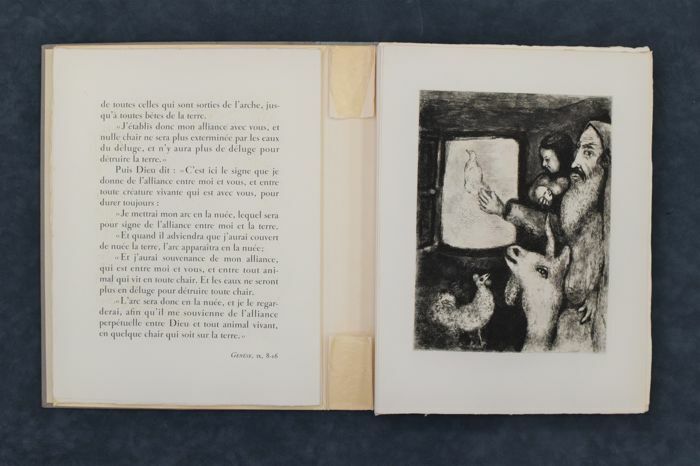 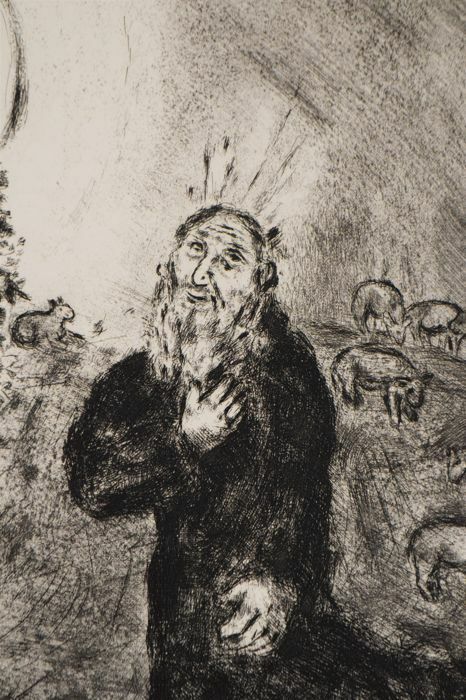 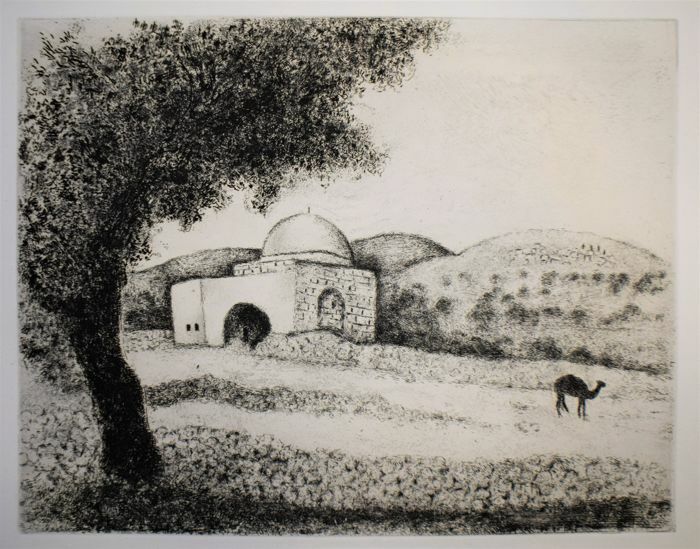 Special book in 2 parts with 104 etchings by Marc Chagall (1887-1985) called La Bible / L'Ancien Testament. 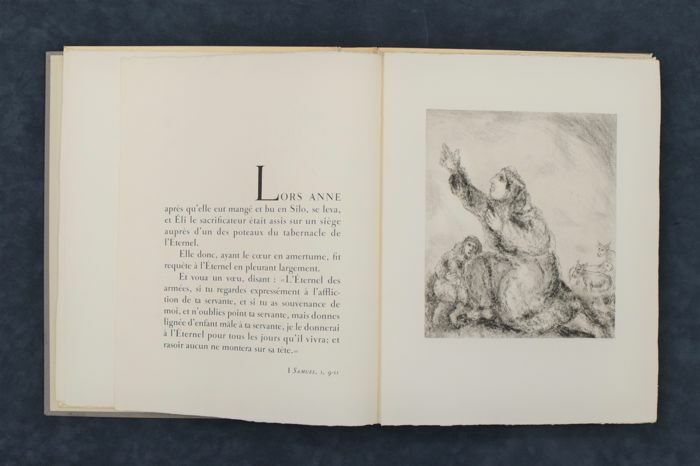 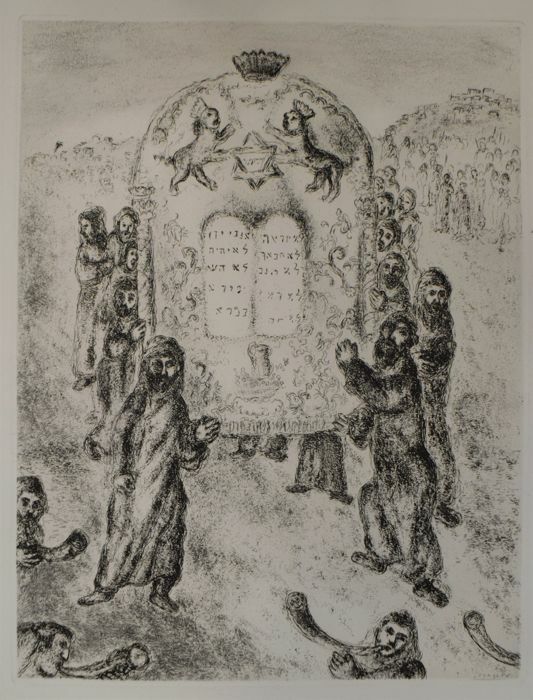 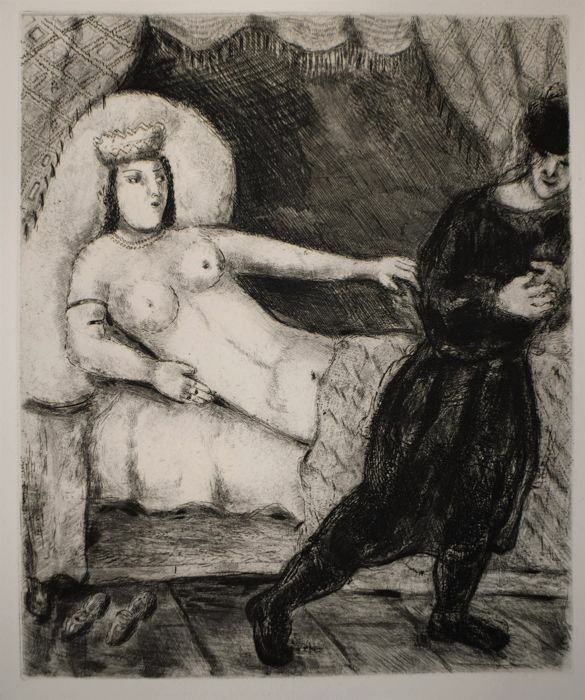 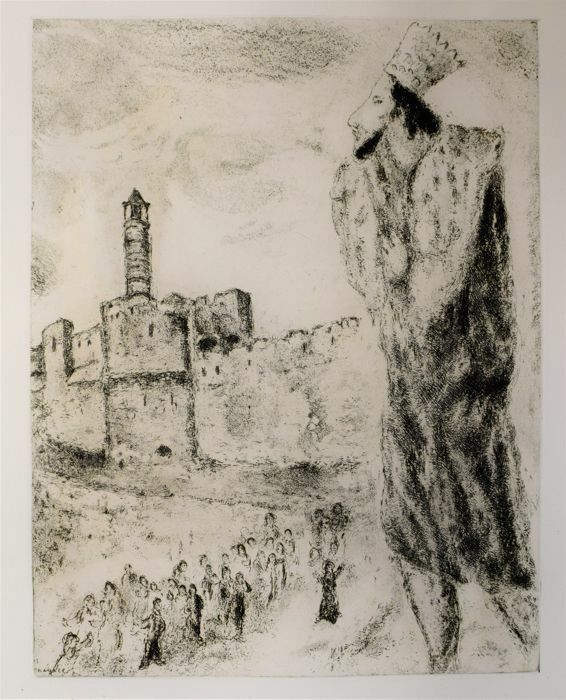 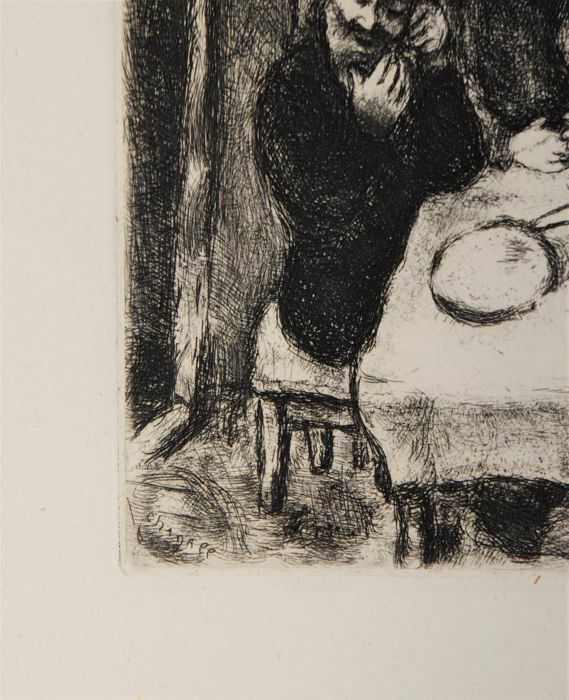 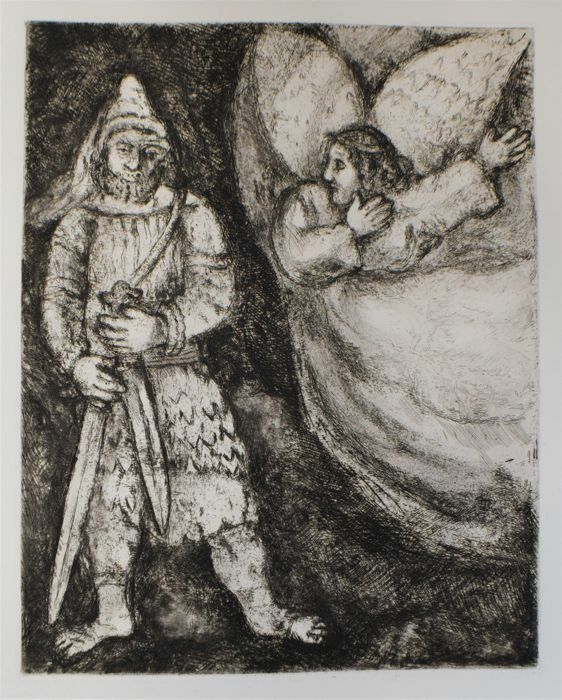 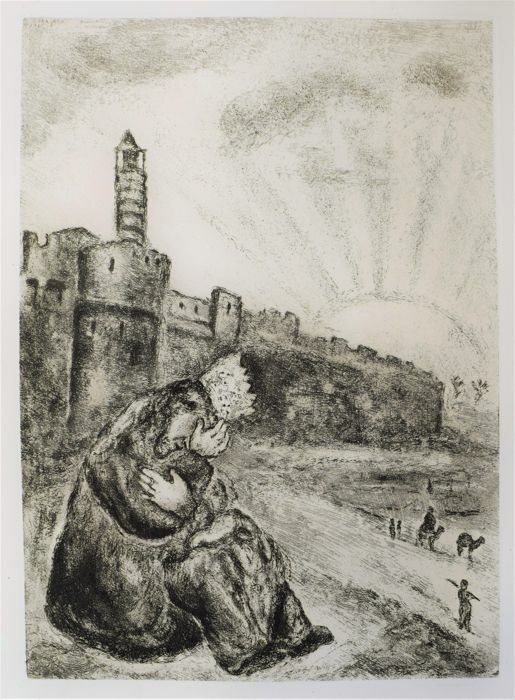 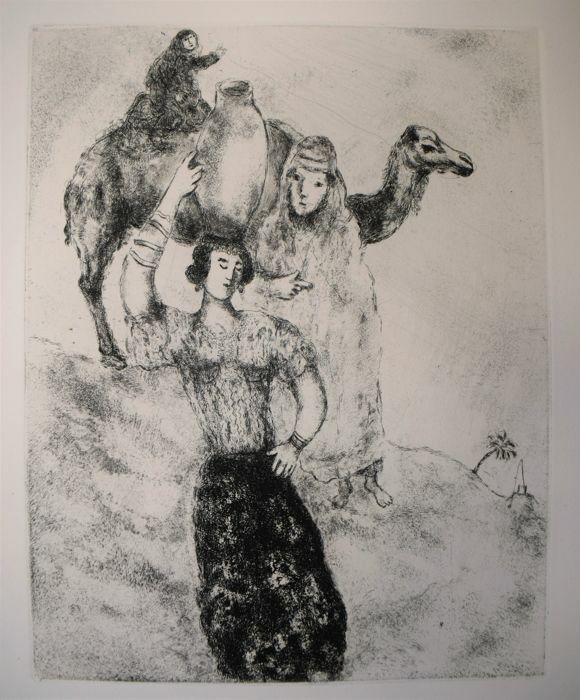 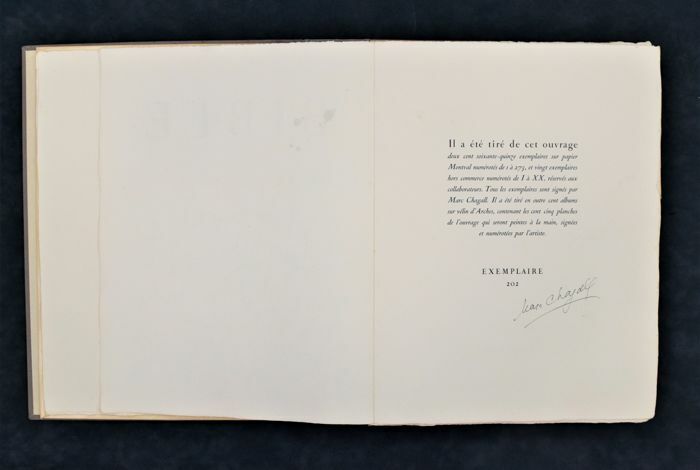 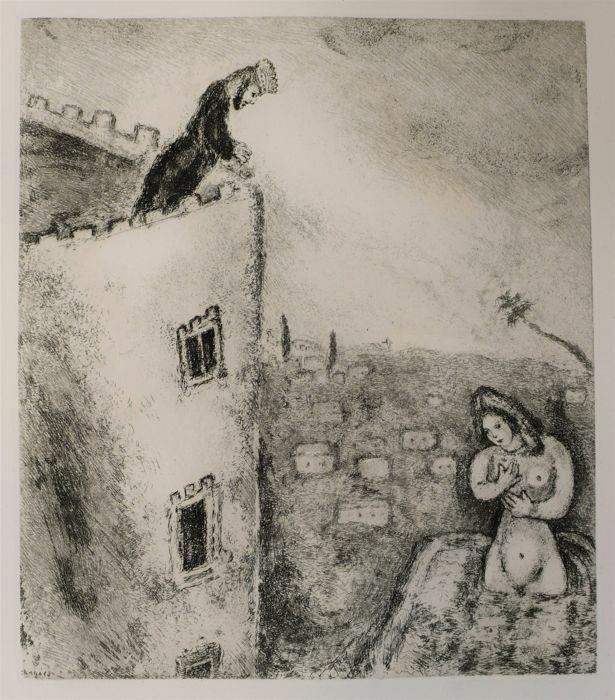 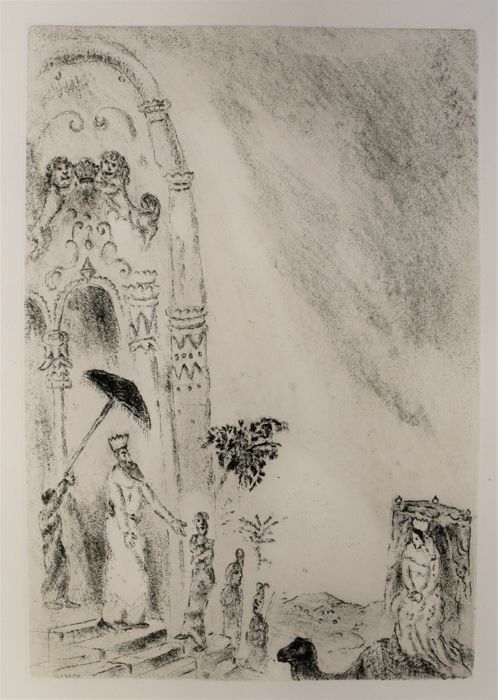 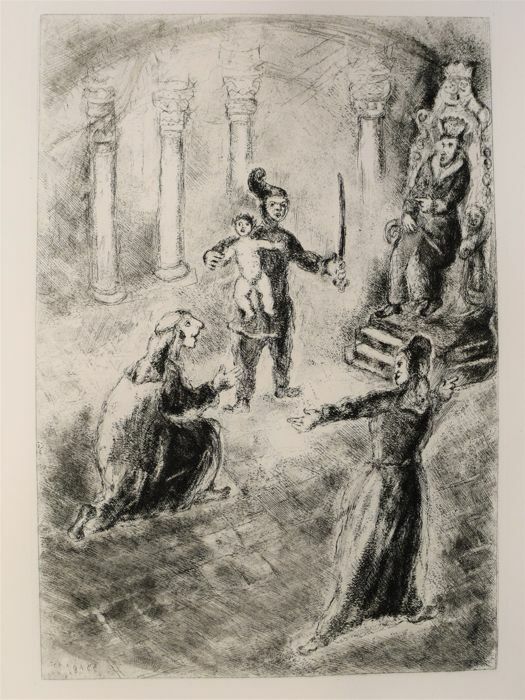 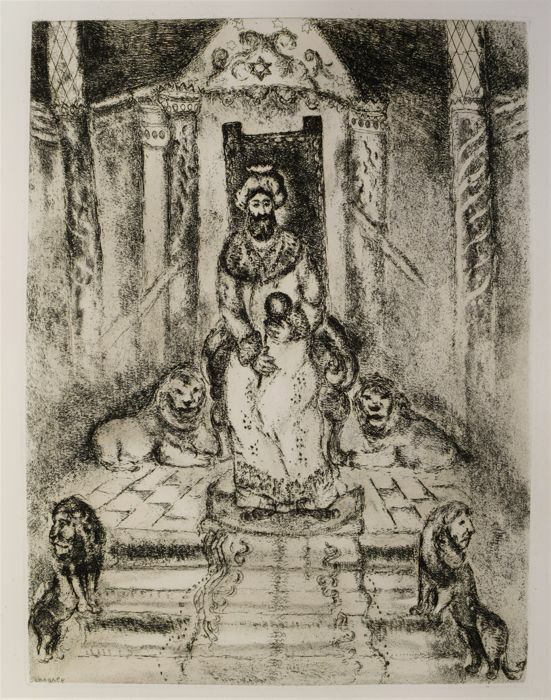 Personally signed by Chagall on the frontispiece, edition 202 of 275. 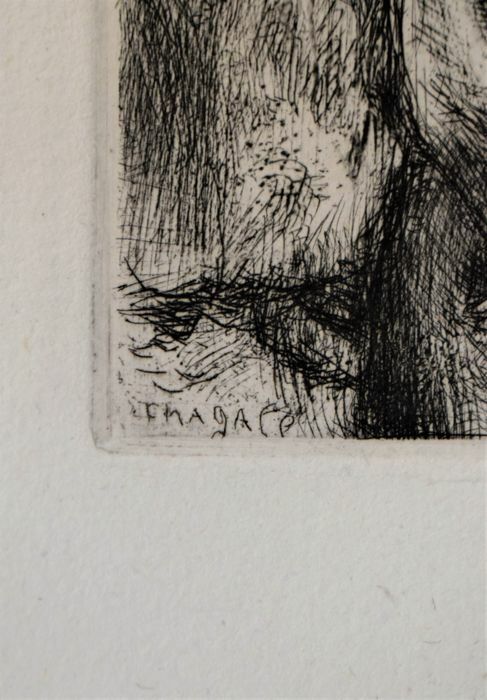 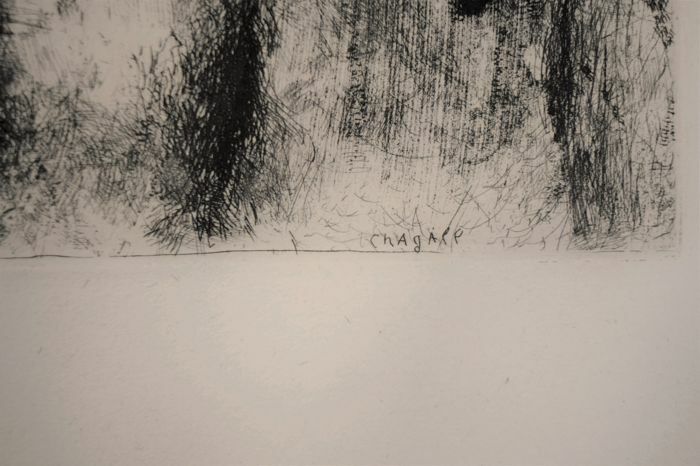 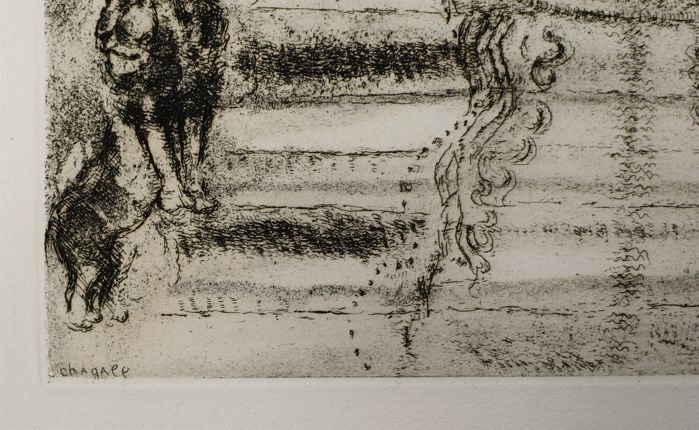 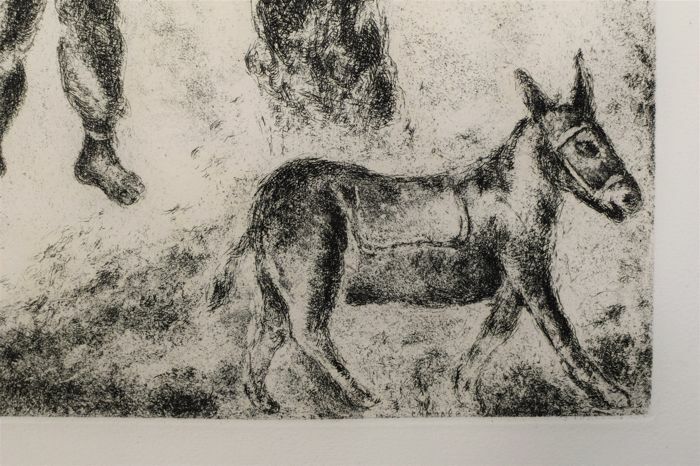 2 parts, 104 etchings, various dimensions. 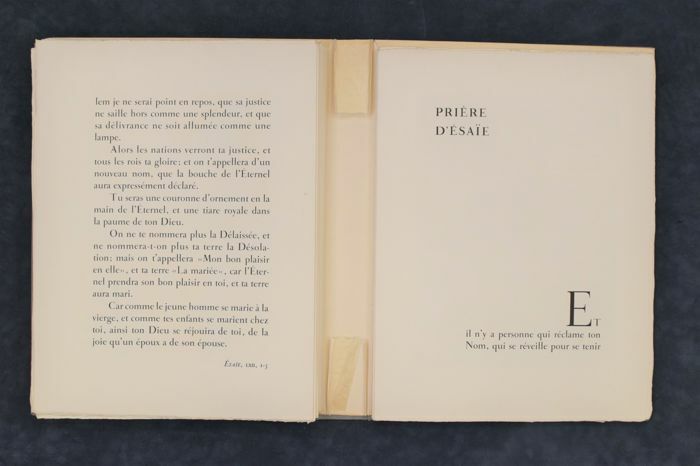 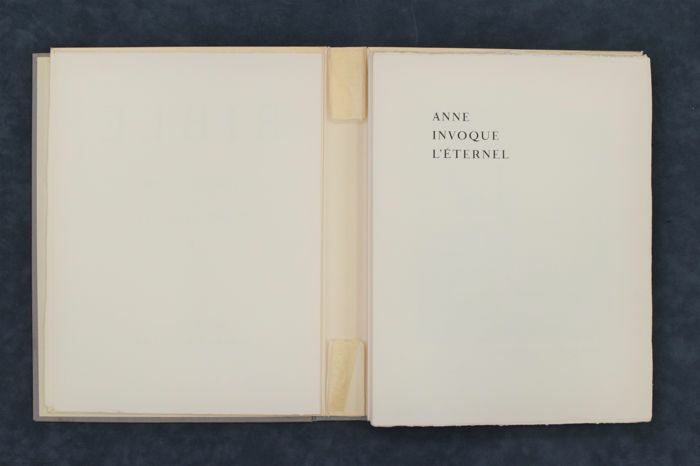 The text printed by: 'Imprimerie Nationale. 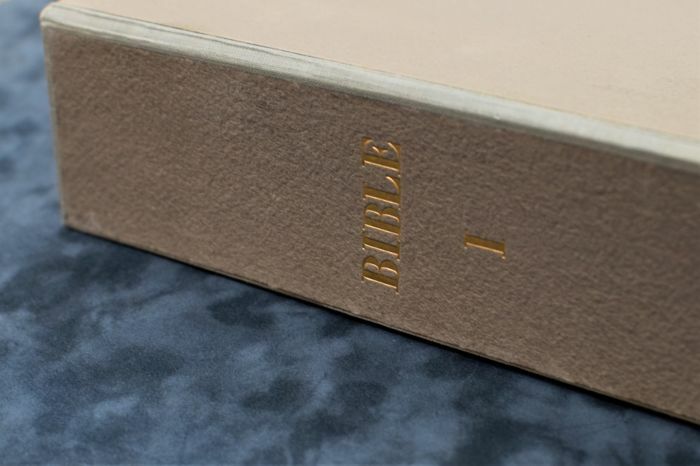 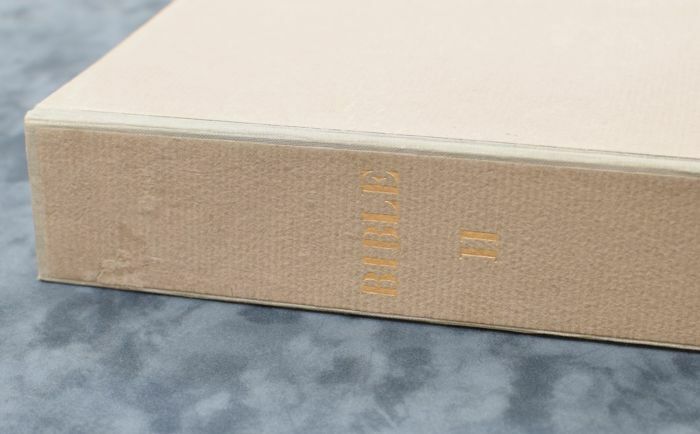 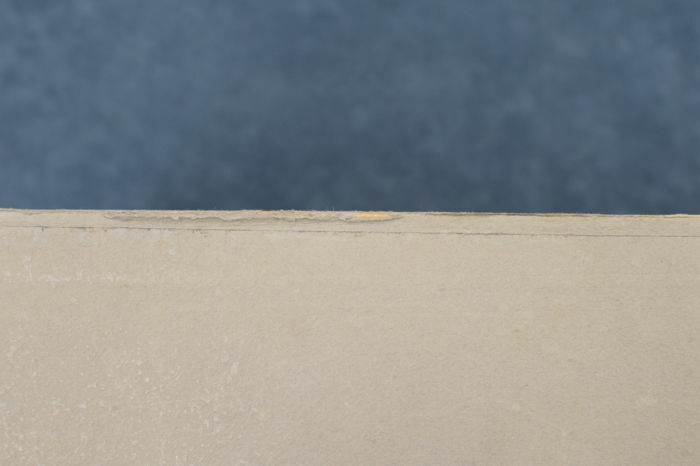 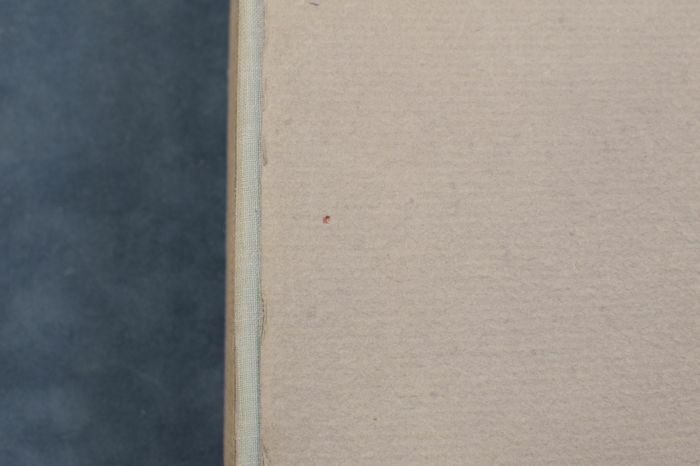 A slight restoration was carried out on the cover and flyleaf by a qualified paper-restorer. 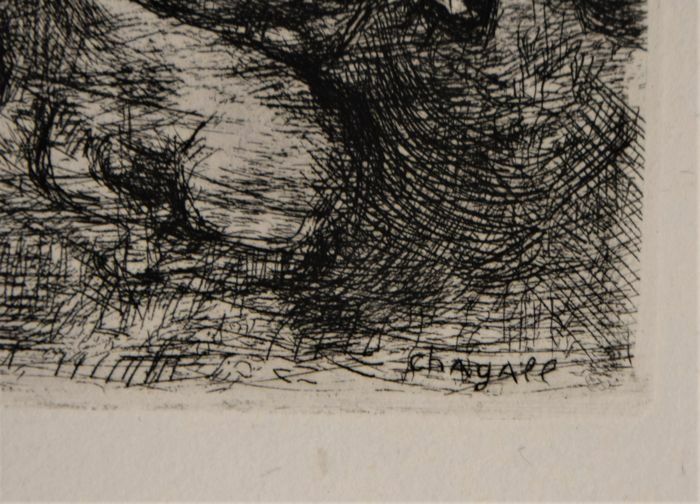 Signature: bottom right on the frontispiece. 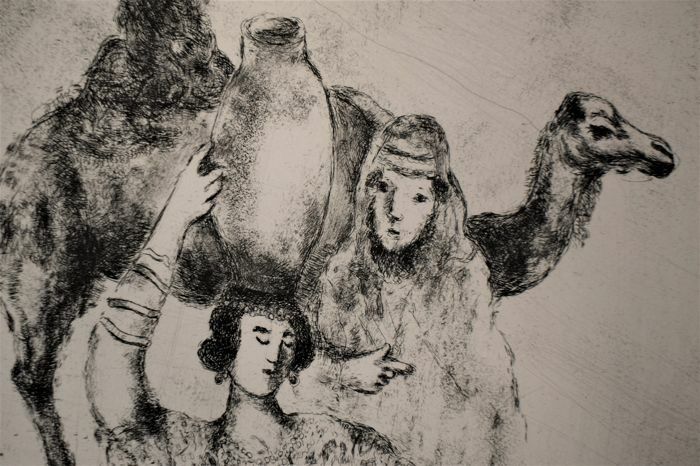 Upgraded shipping, additionally insured by art transport. 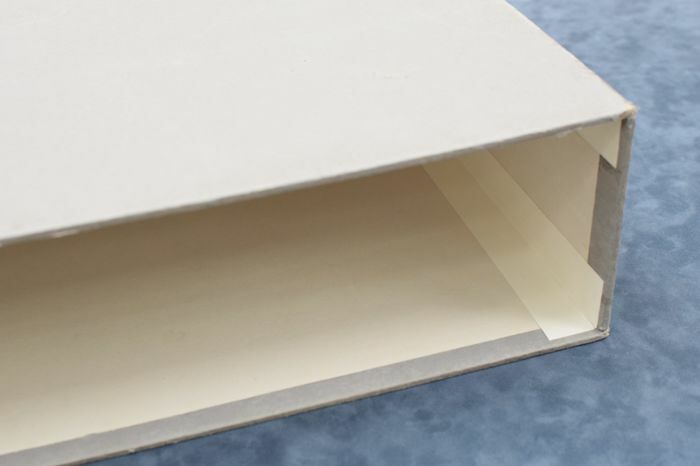 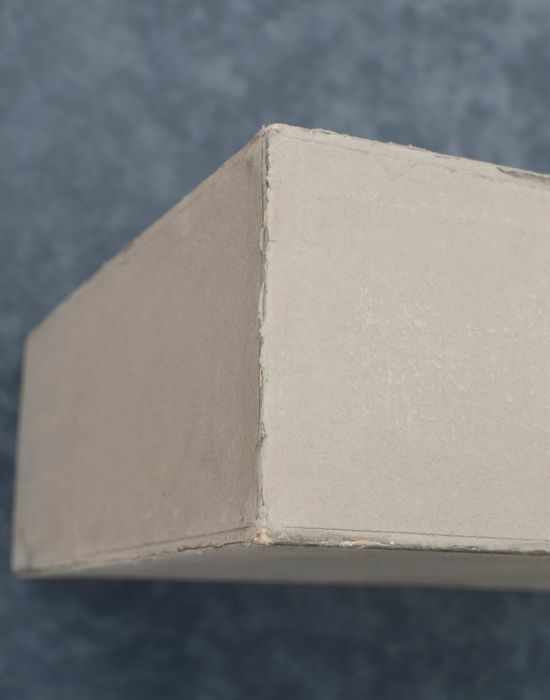 Due to customized packaging, it may take a few days longer before the parcel is shipped. 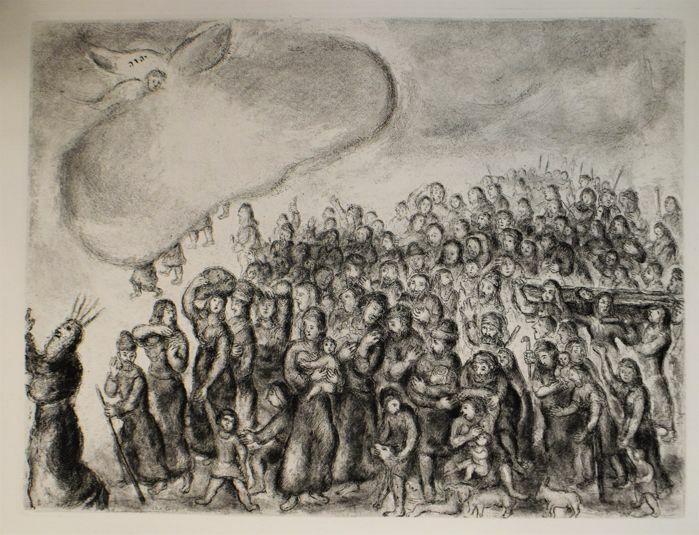 You are free to choose to collect and organise your own transport. 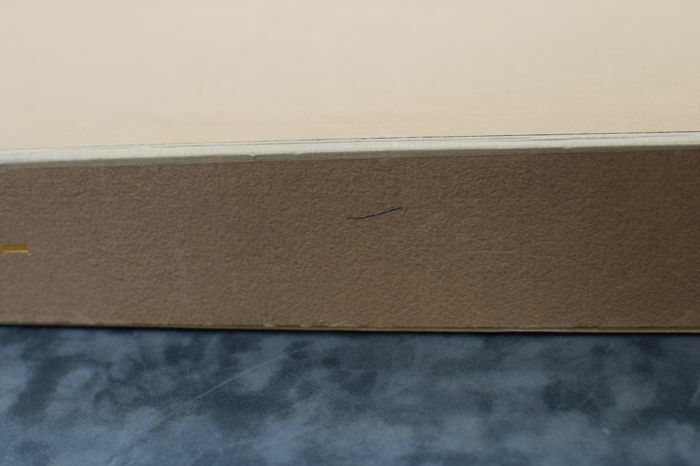 In this case you are personally responsible for proper packaging of the object. 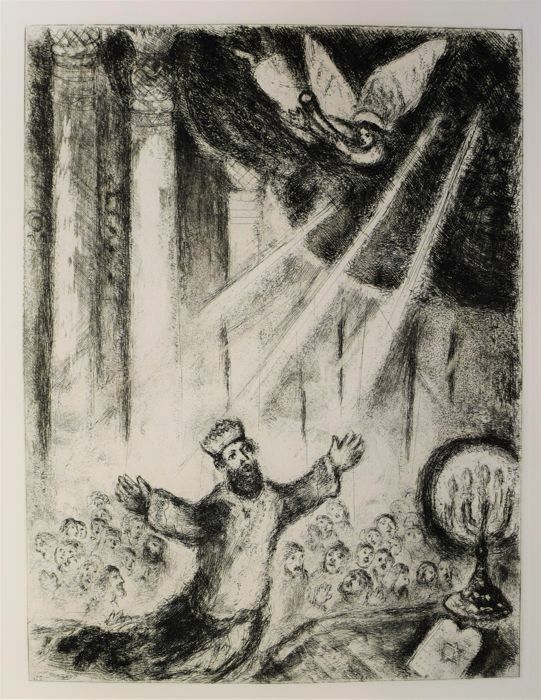 The Russian artist Marc Chagall was born in Liozno by Vitebsk in 1887. 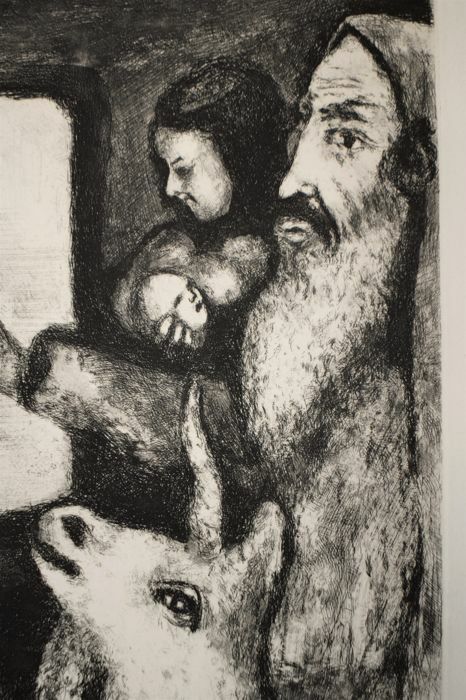 He grew up in a poor Jewish environment. 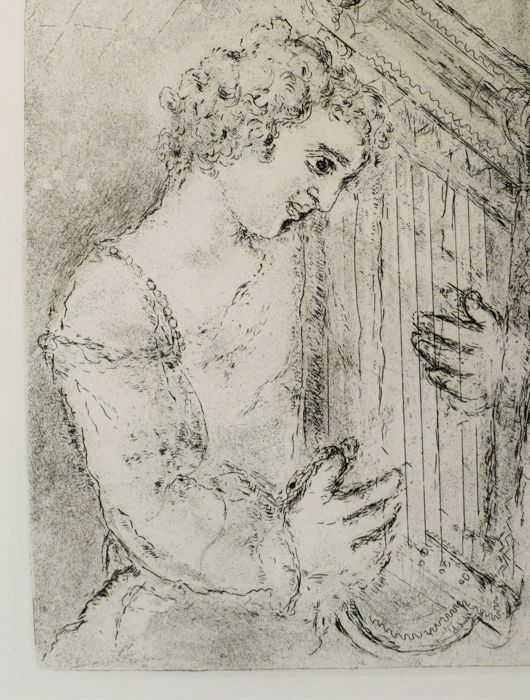 After drawing lessons, he went to Saint Petersburg to study at the Academy of Fine Arts. 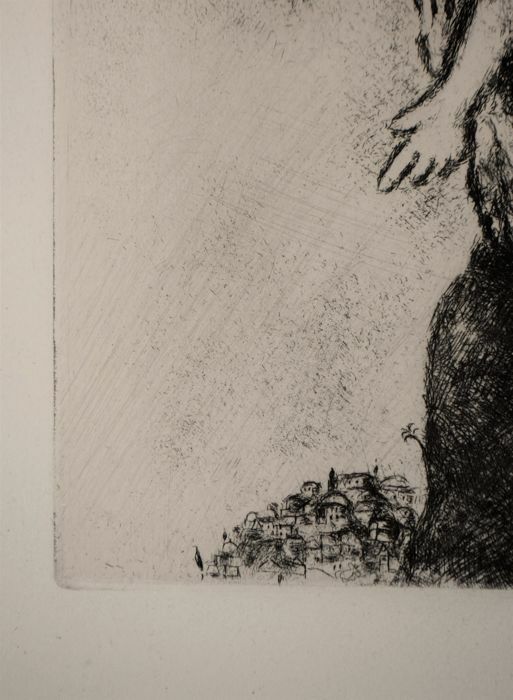 After a period in Paris and Berlin, he returned to Russia when the First World War broke out. 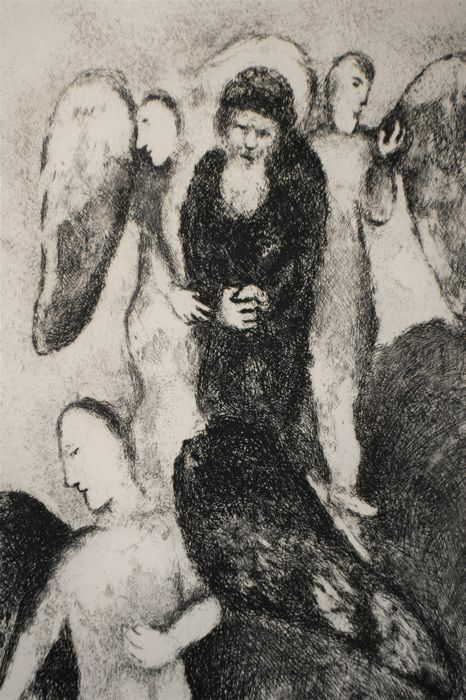 His work is often associated with surrealism. 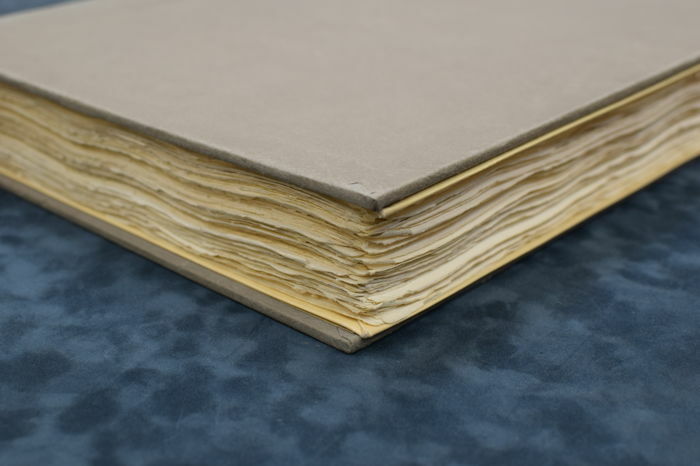 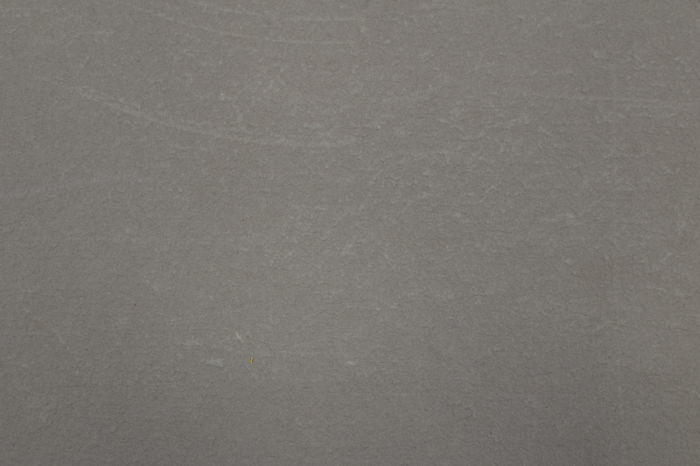 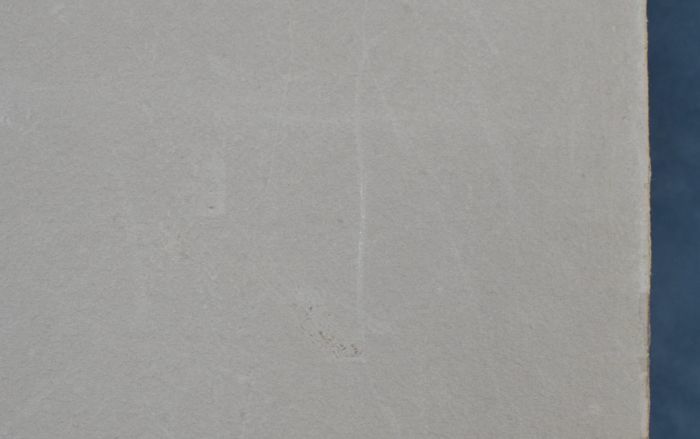 When actually, it is not part of any style in particular, but can be seen as part of many different styles. 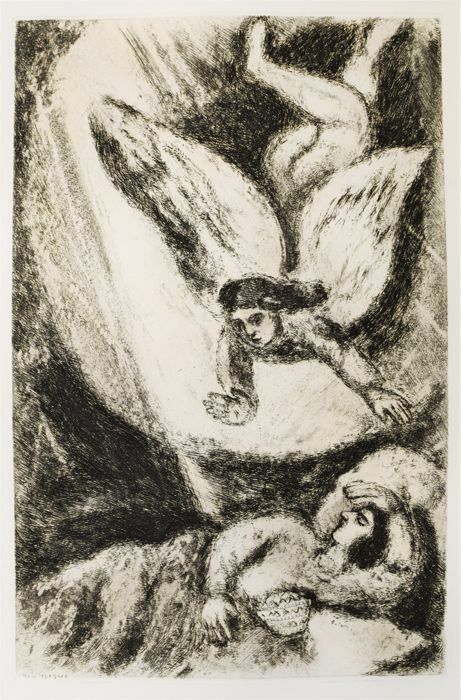 Chagall has his own dreamlike style. 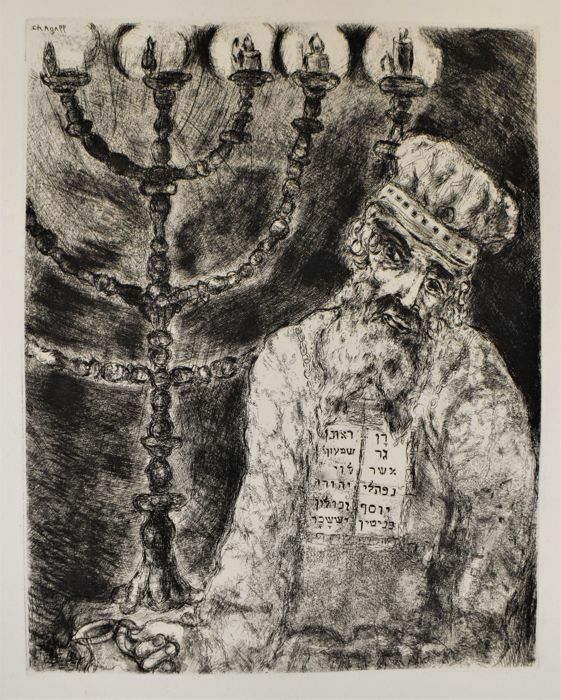 He was inspired by Russian folk art and life, the memories of his youth and the role of Judaism in this. 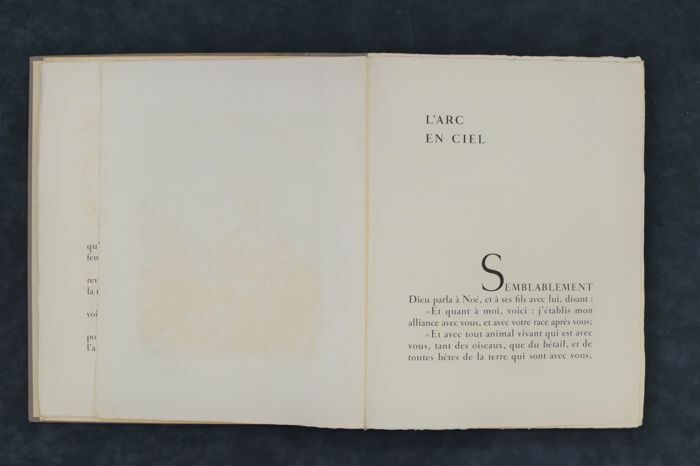 He combined elements of this with, among others, the colour of the modern styles which he encountered in Paris. 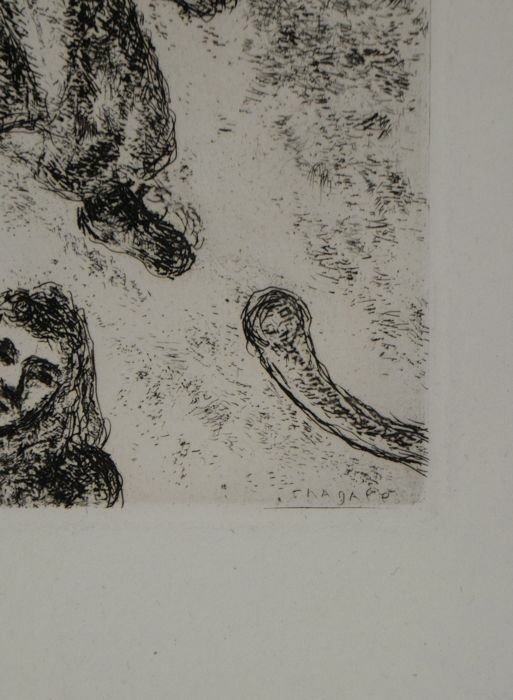 The Parisian surrealists were searching to make that which is above reality, visible. 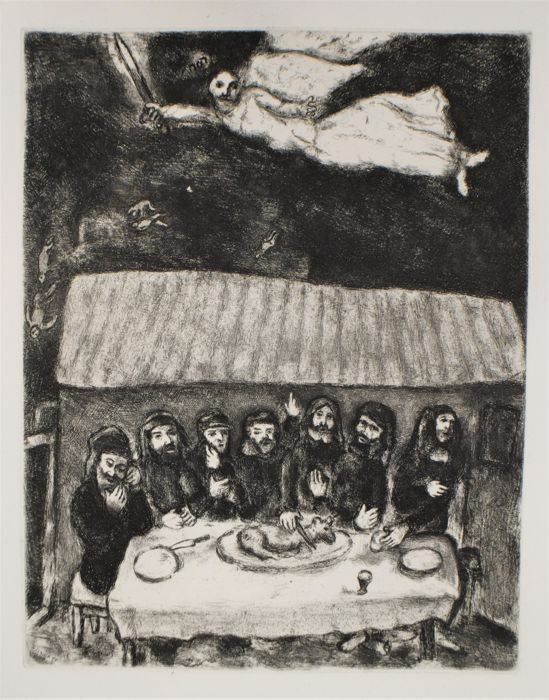 But the ideas that Chagall brought to life on his canvases, did not completely match with those of the Surrealists. 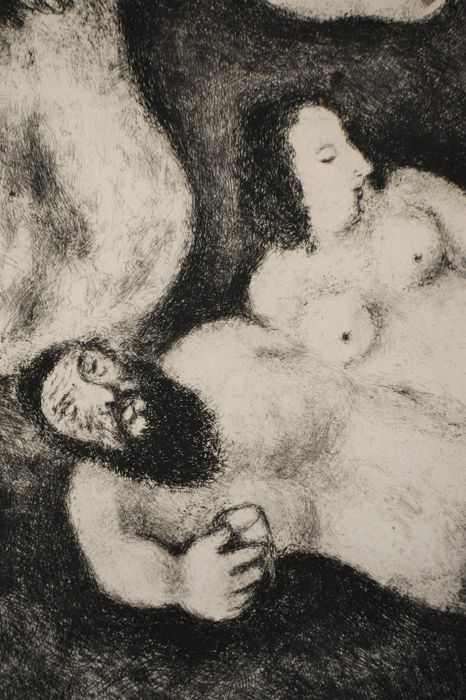 "At a very early age, I already felt the need to create an illogical world’, he says. 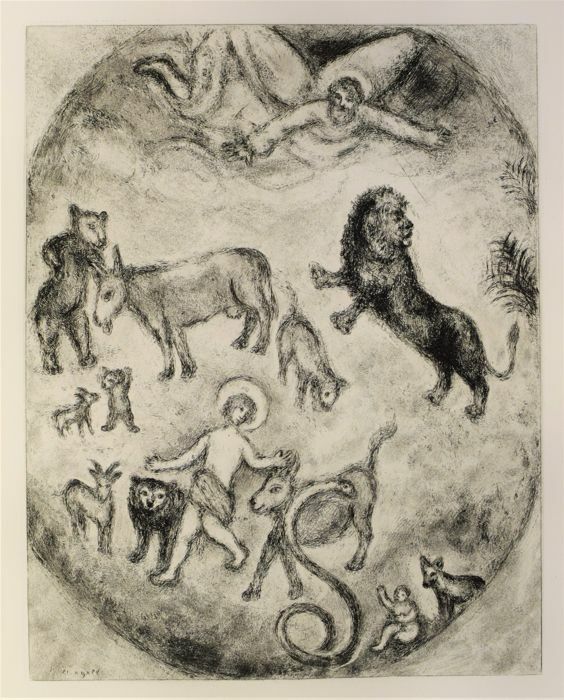 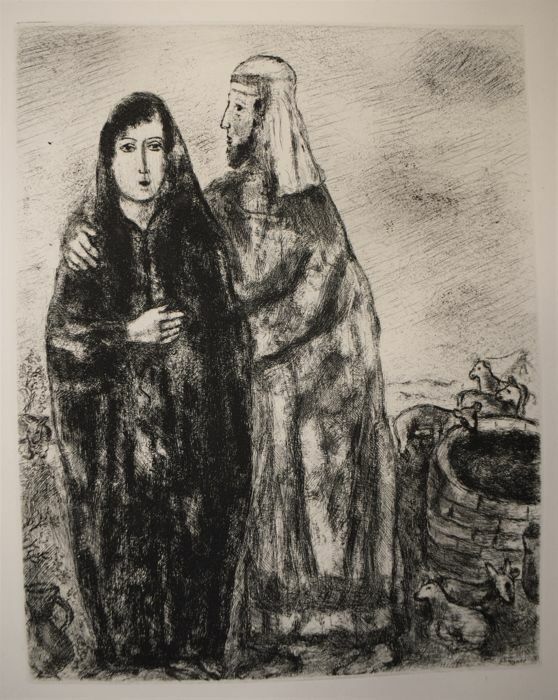 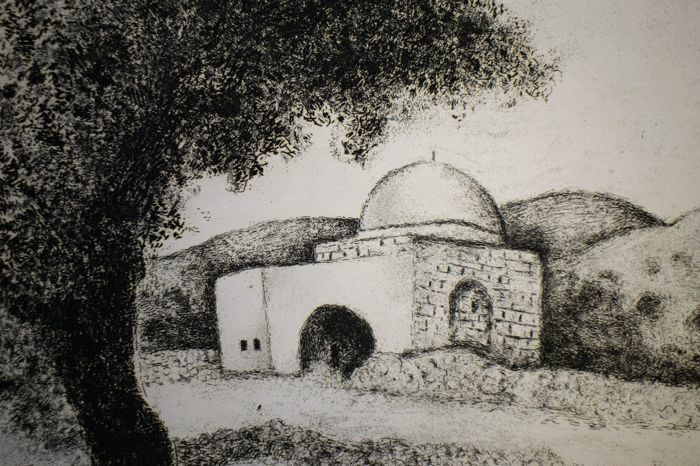 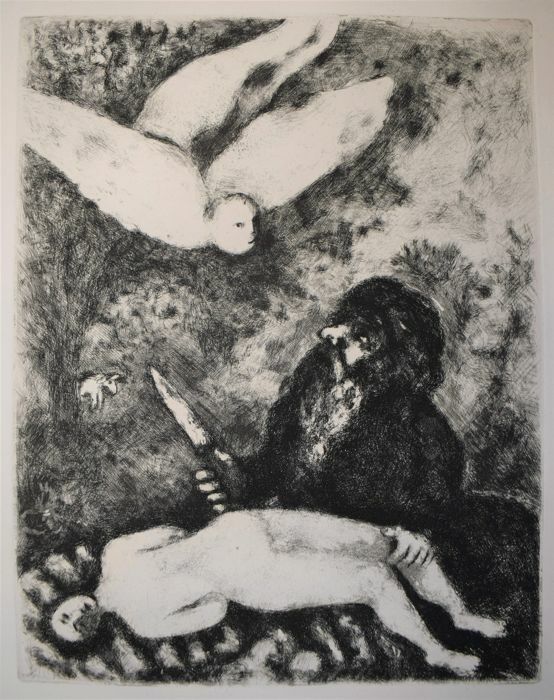 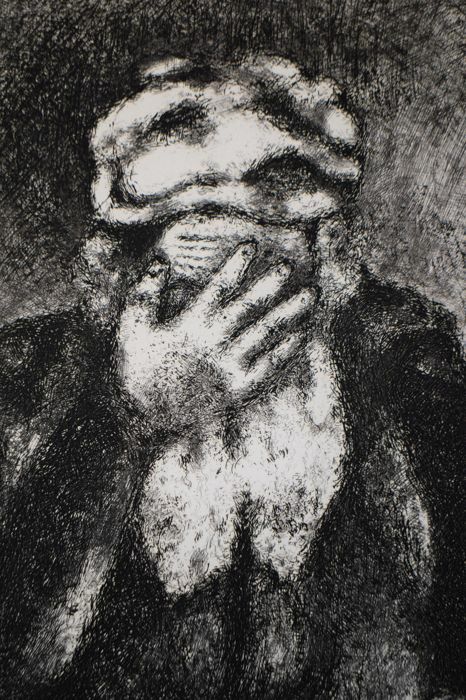 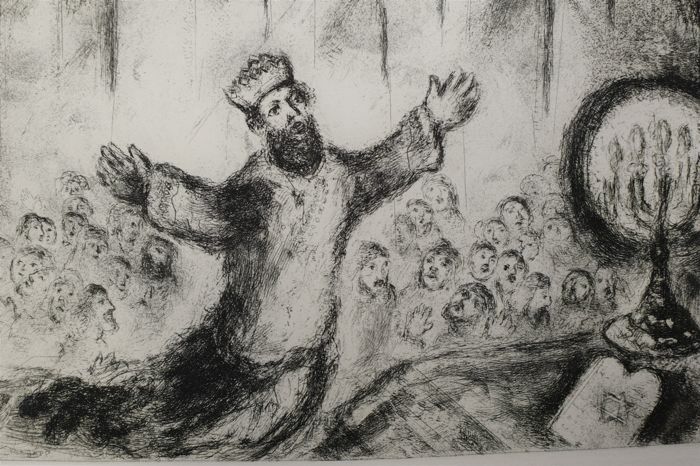 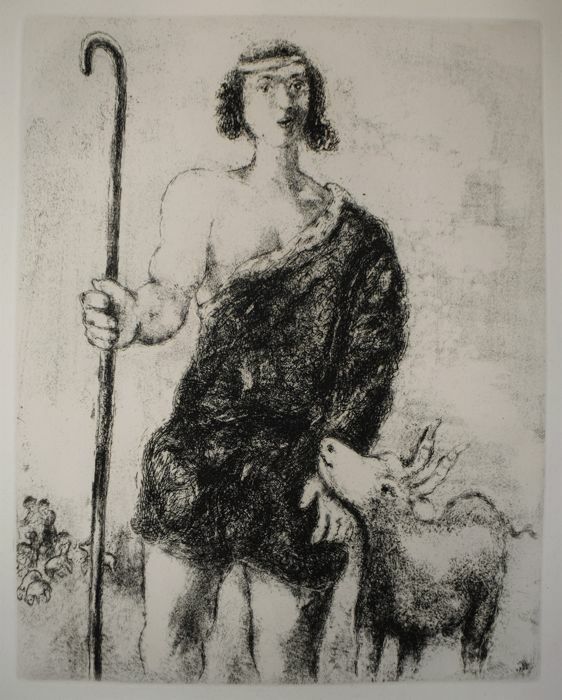 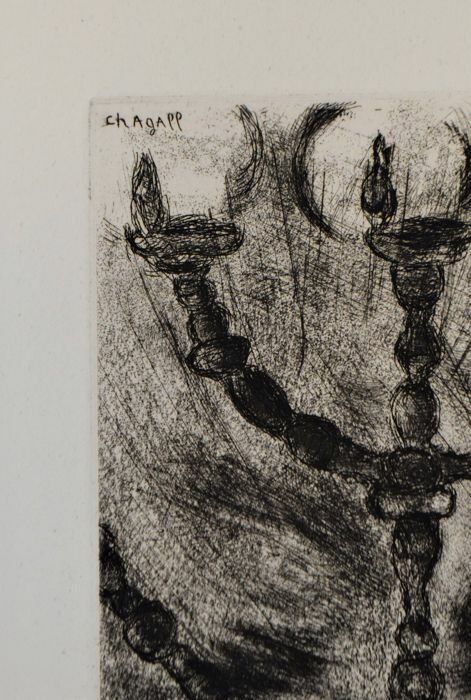 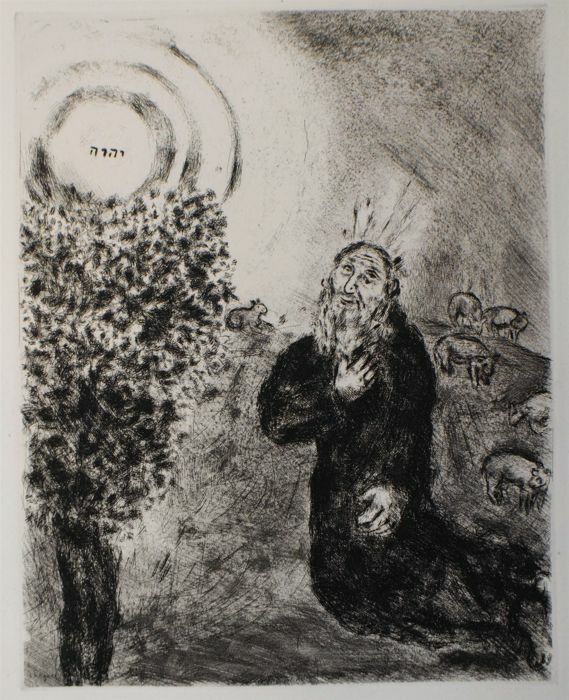 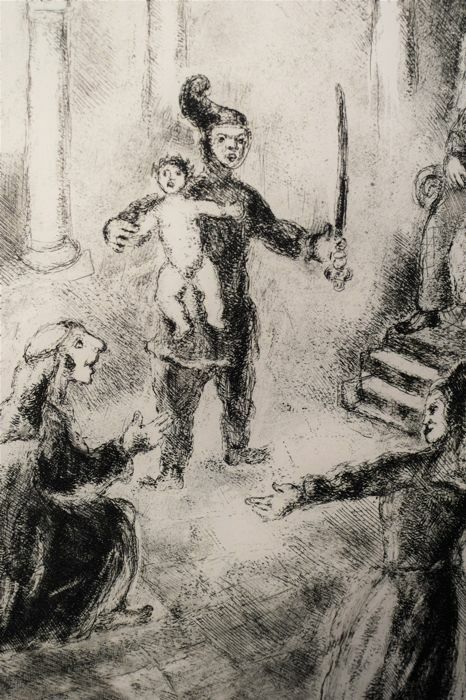 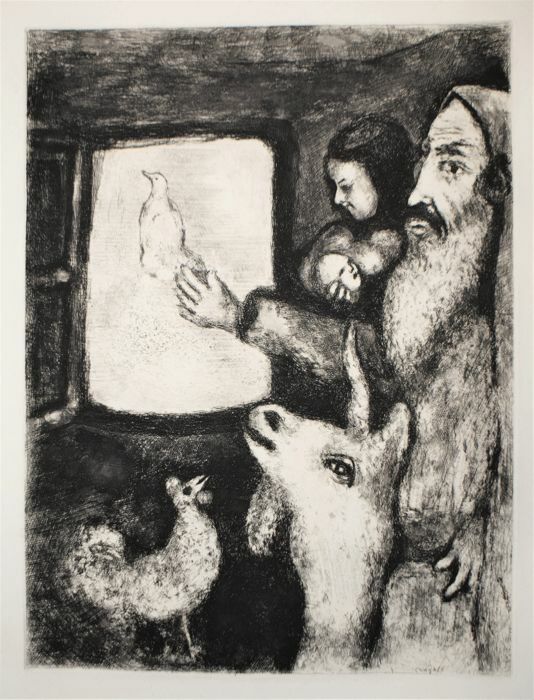 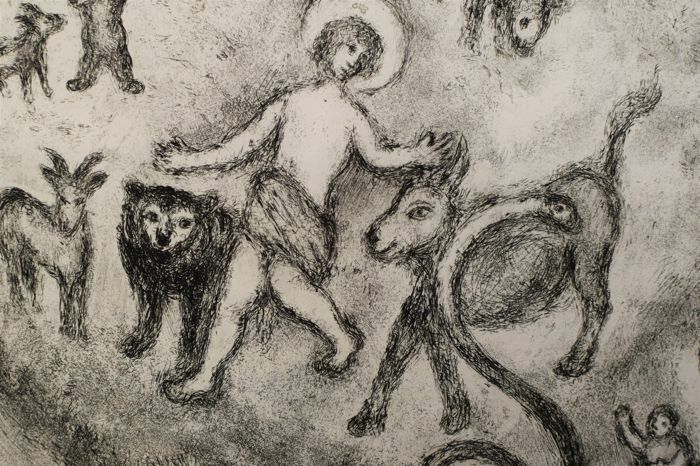 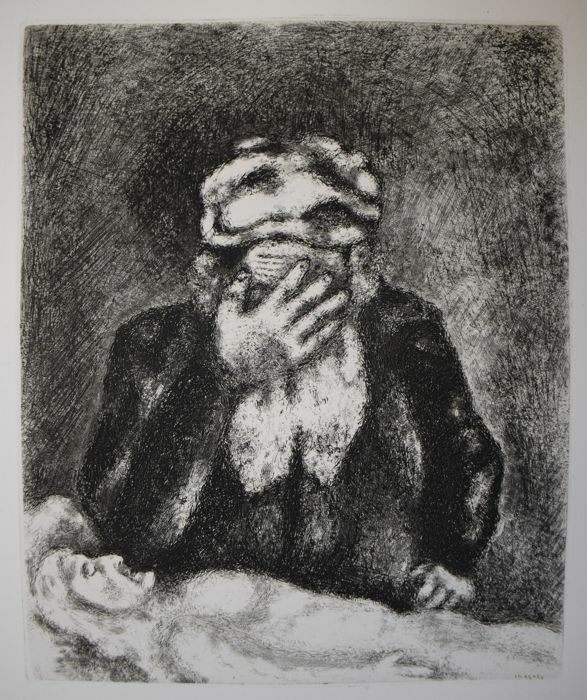 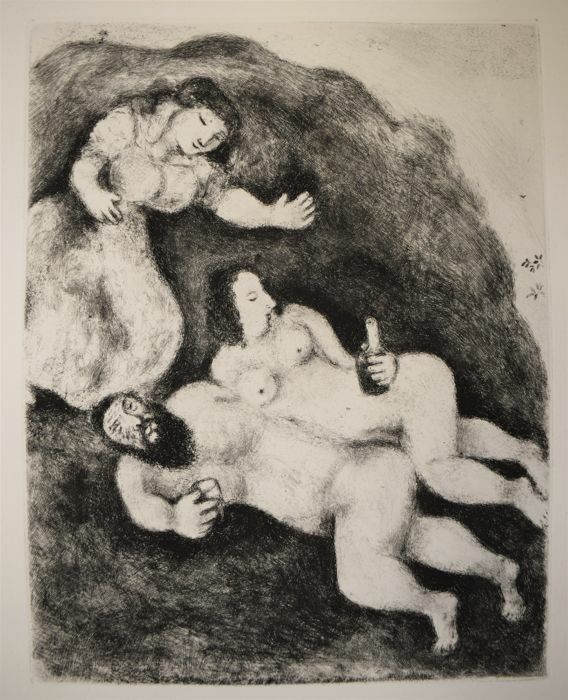 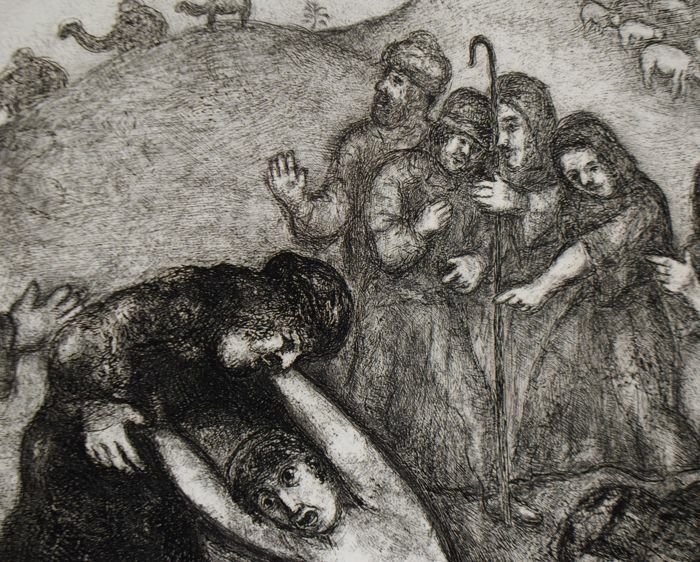 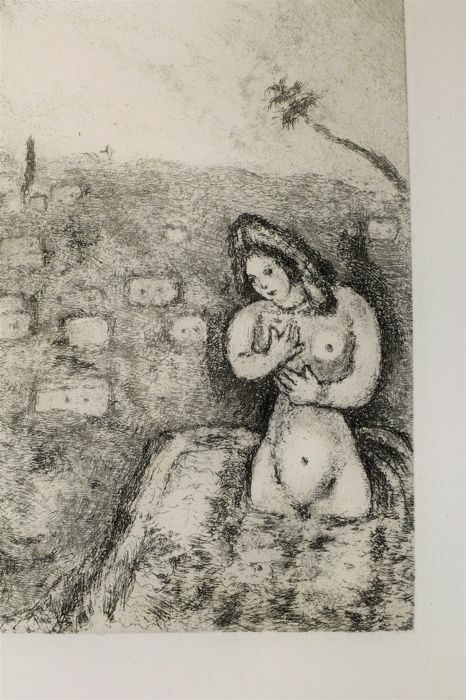 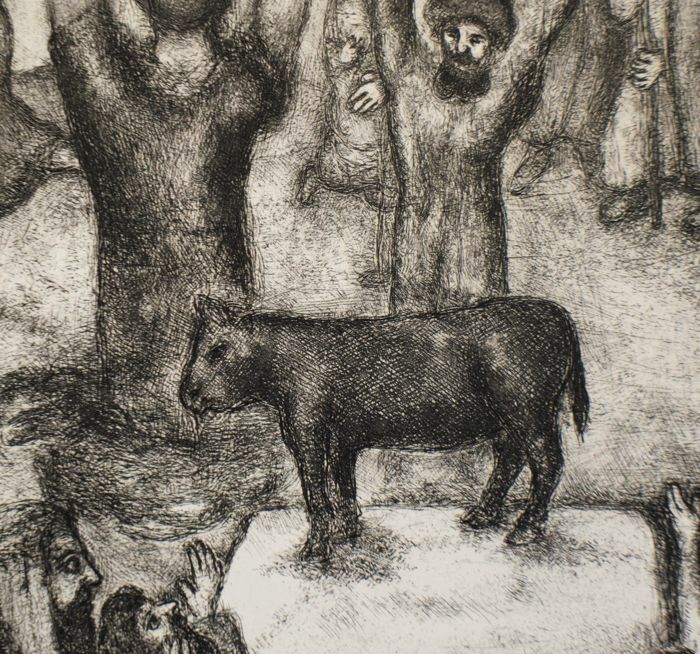 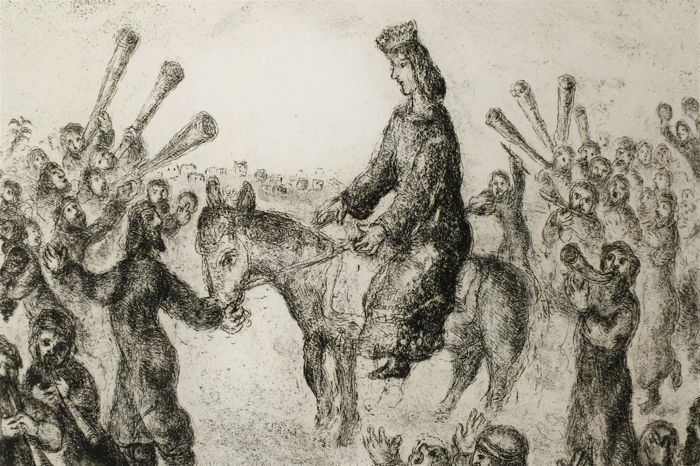 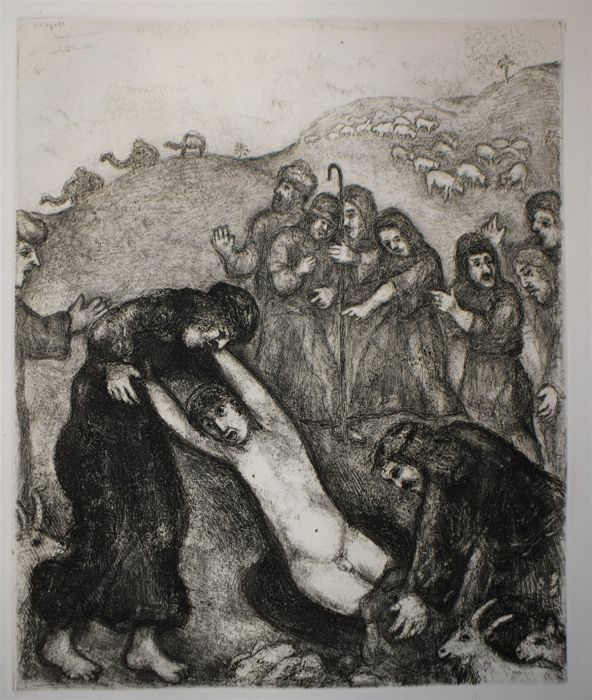 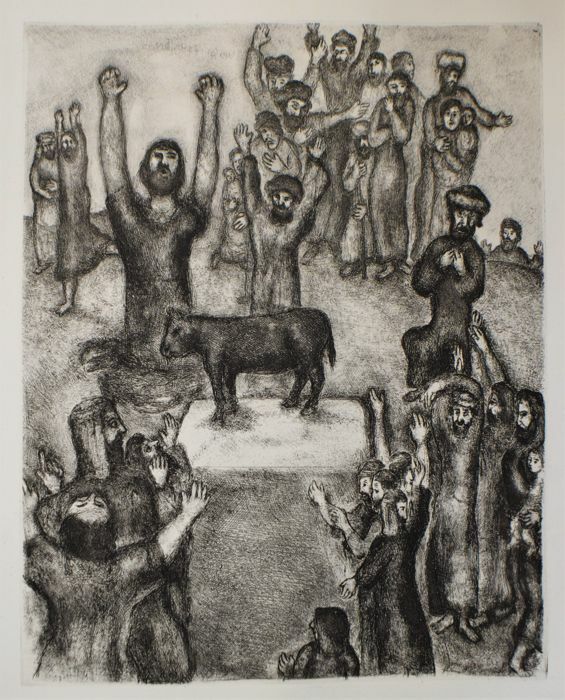 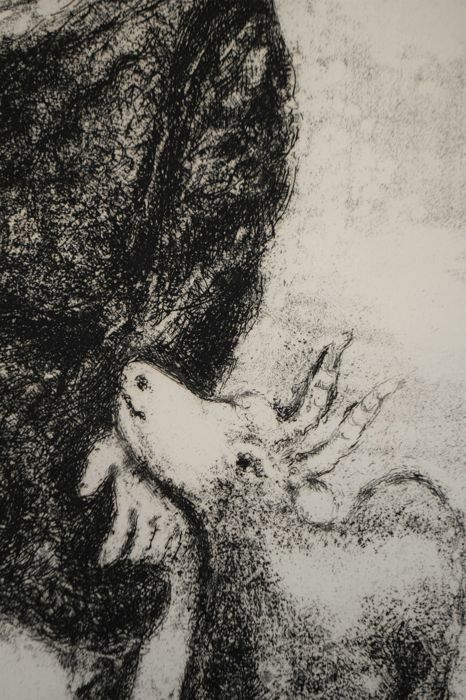 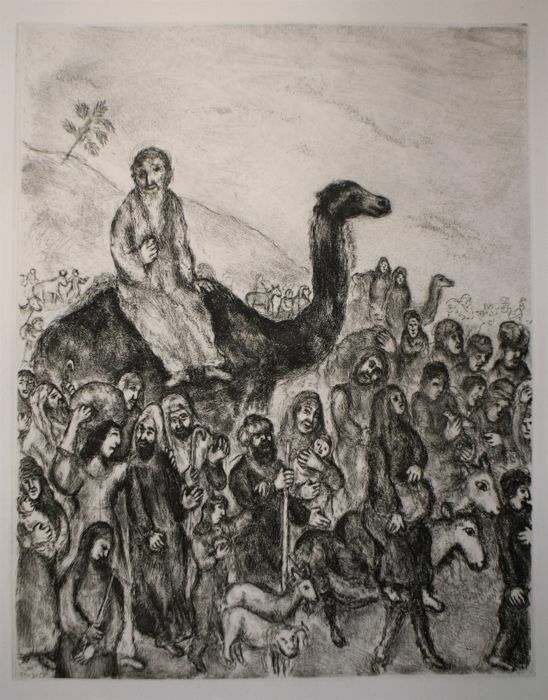 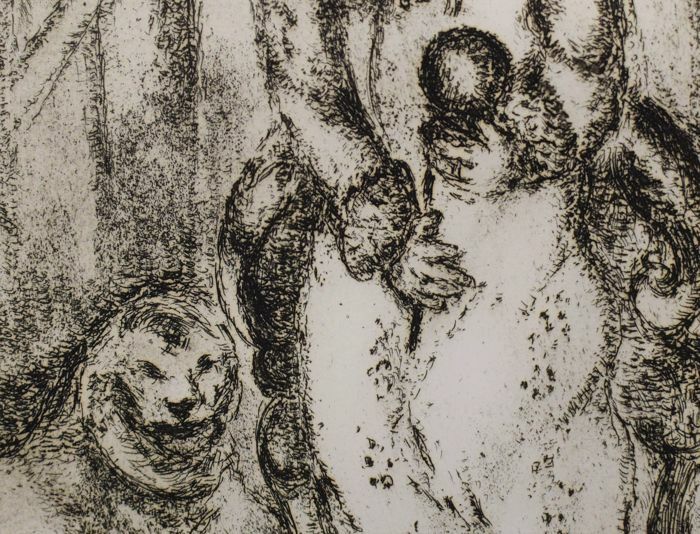 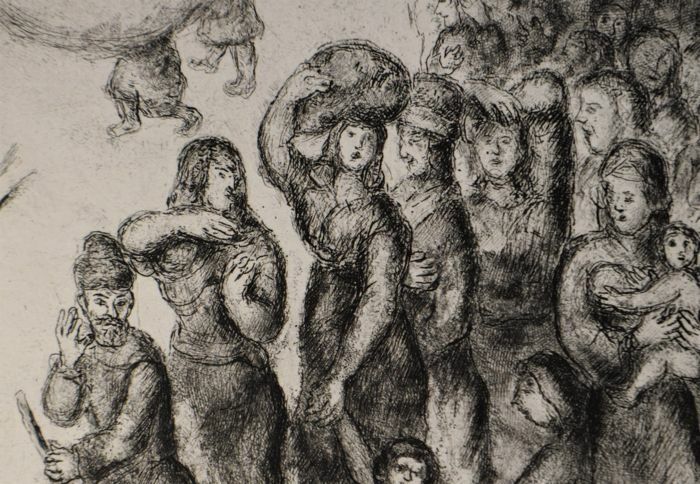 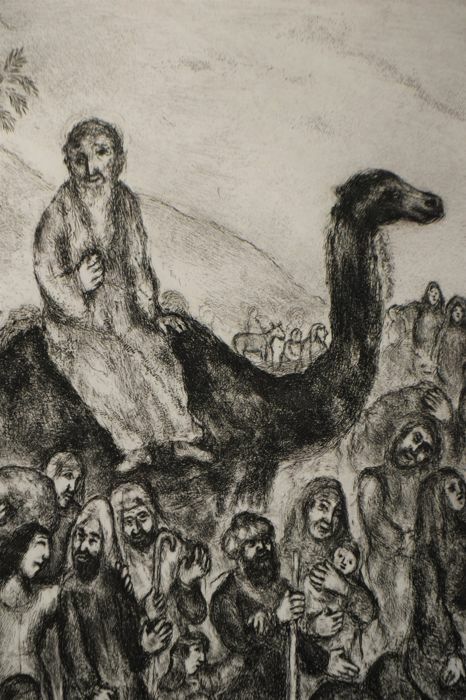 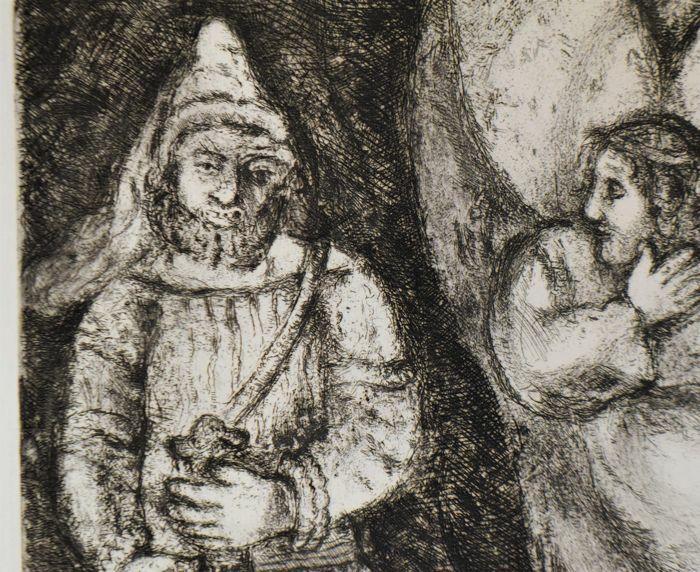 Chagall was also frequently inspired by the Bible. 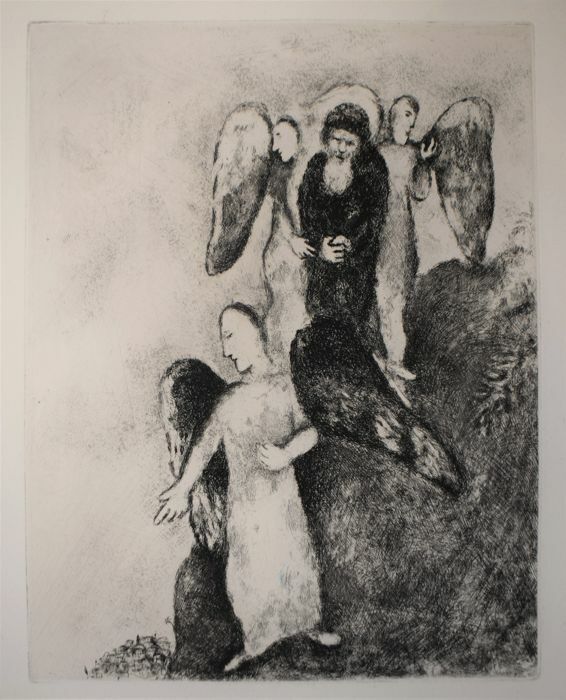 This started with the creation of illustrations, but was interrupted by the Second World War, when he fled to America. 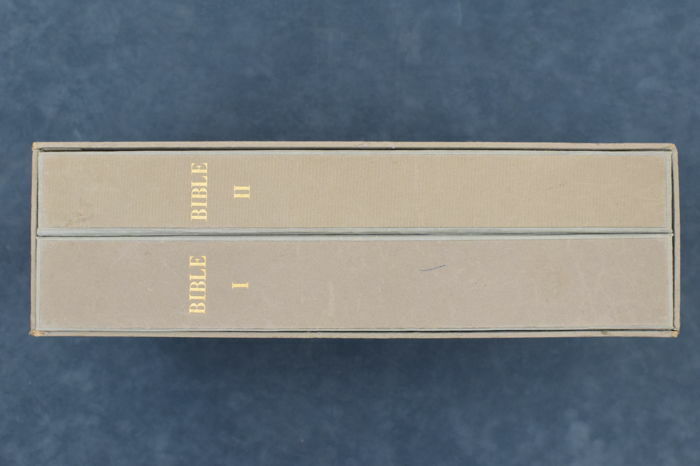 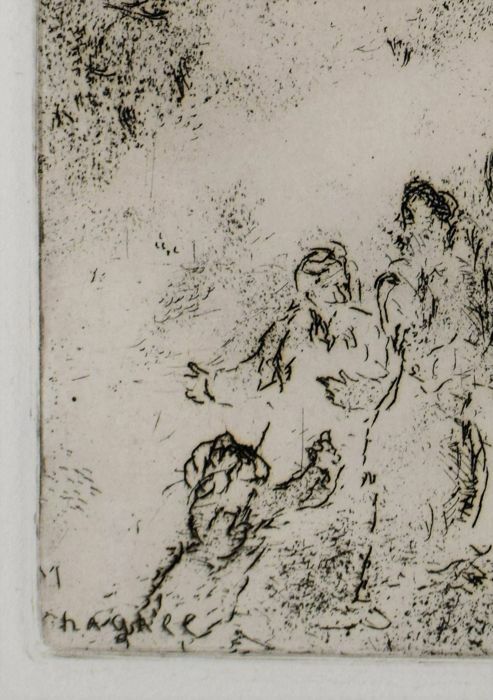 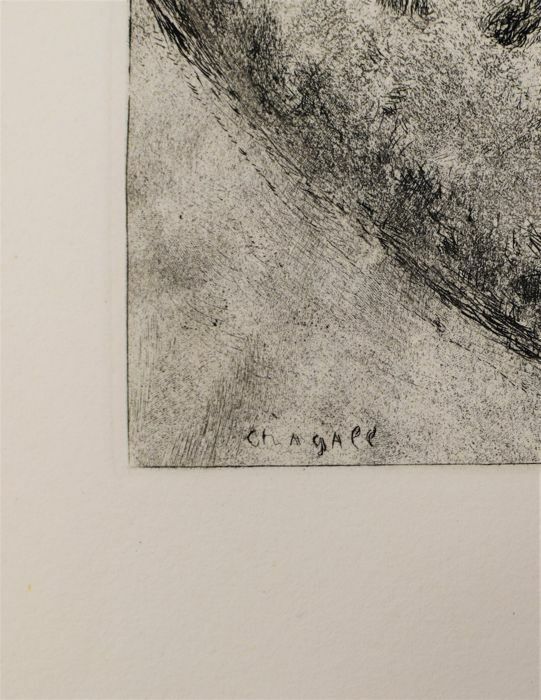 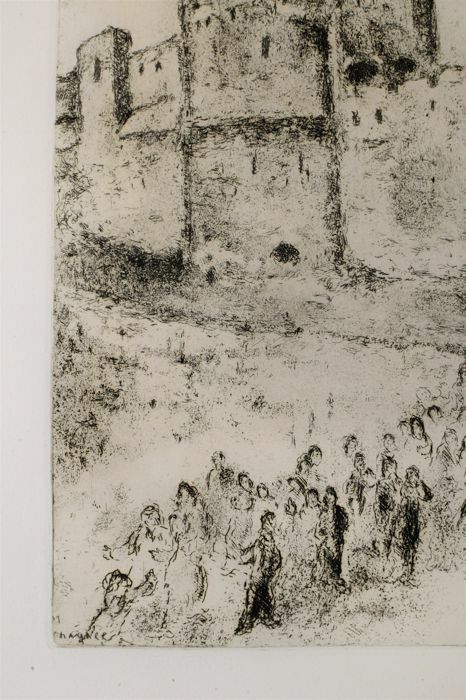 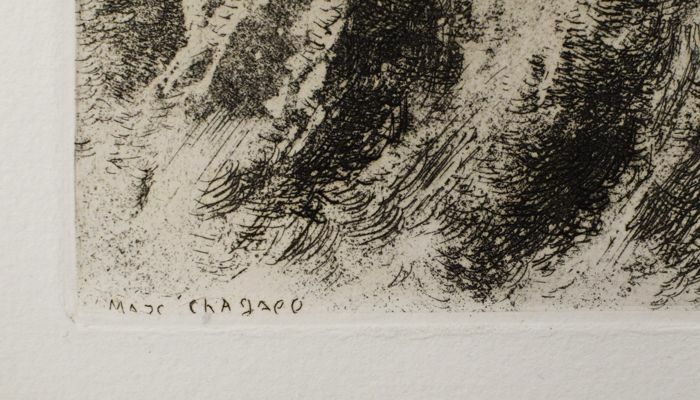 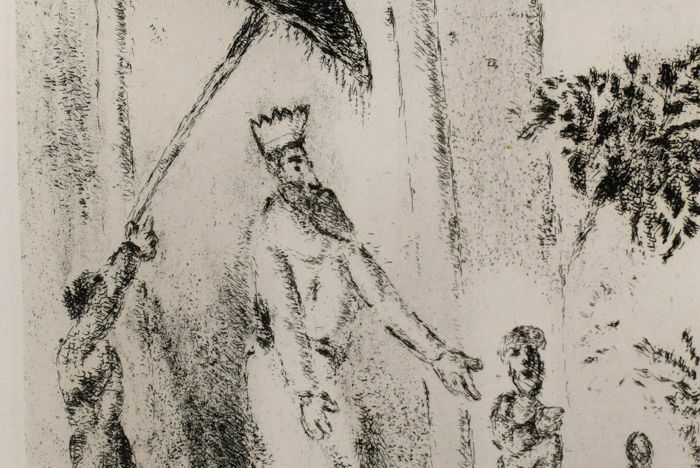 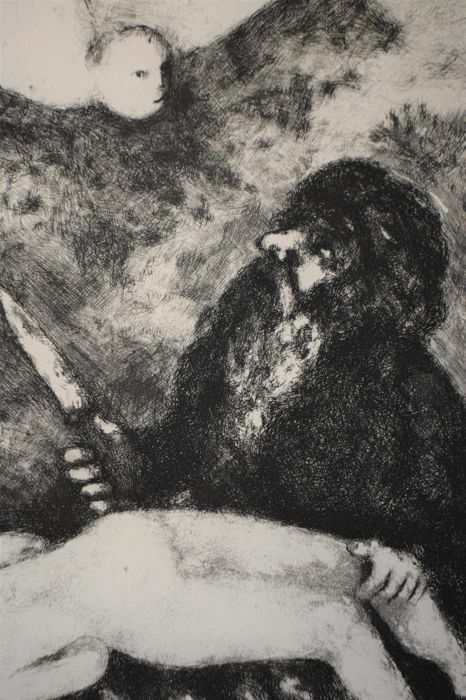 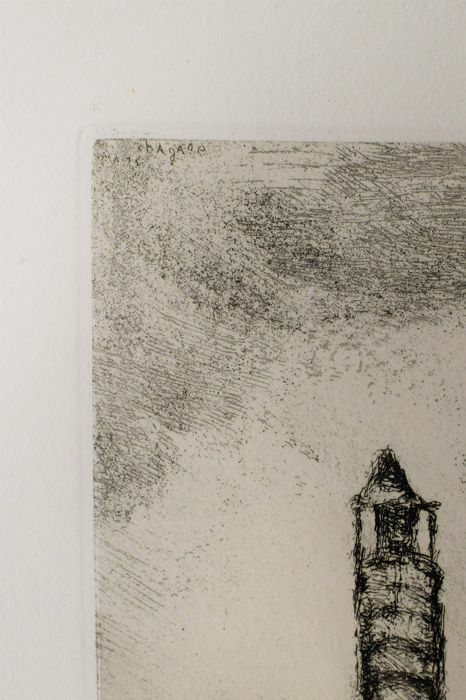 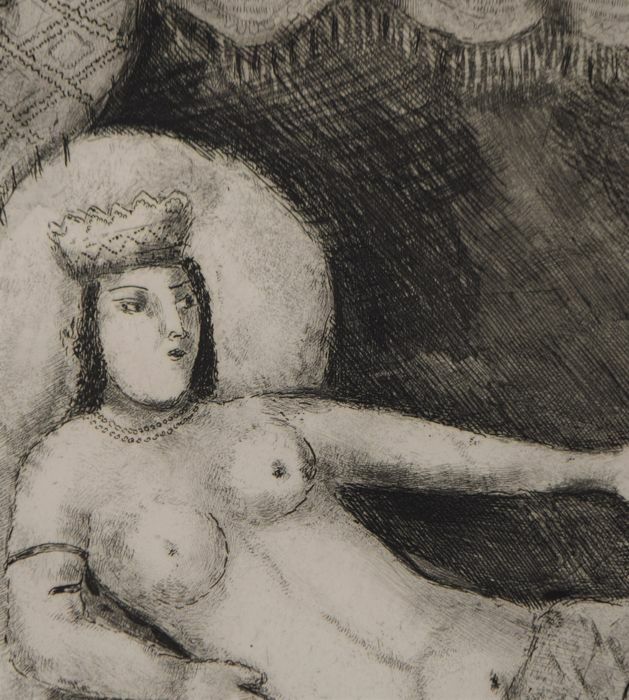 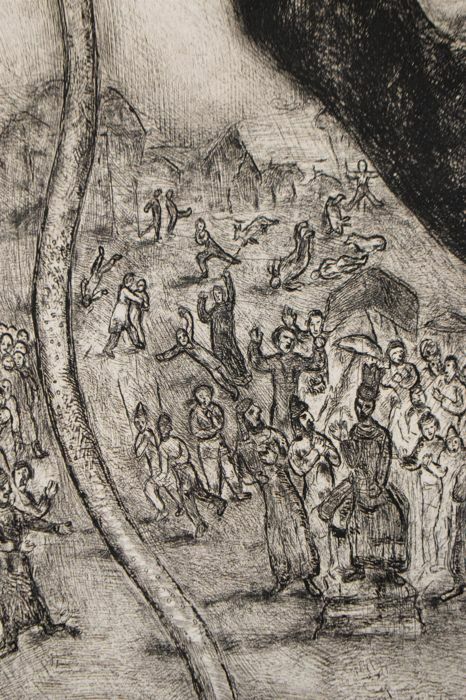 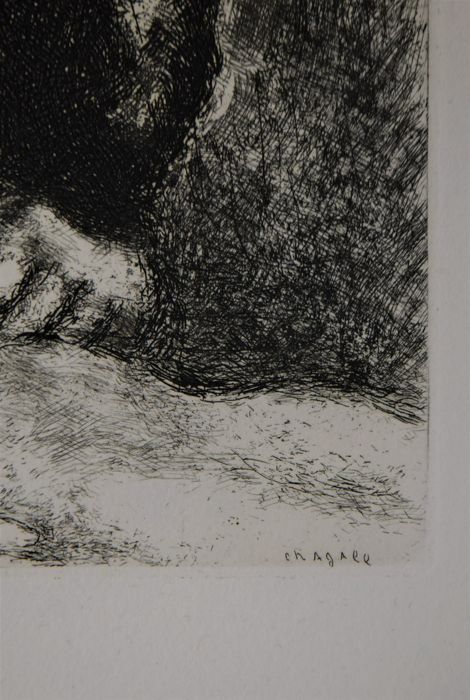 Sixty etchings under the name ‘Message biblique’ were ready by this time. 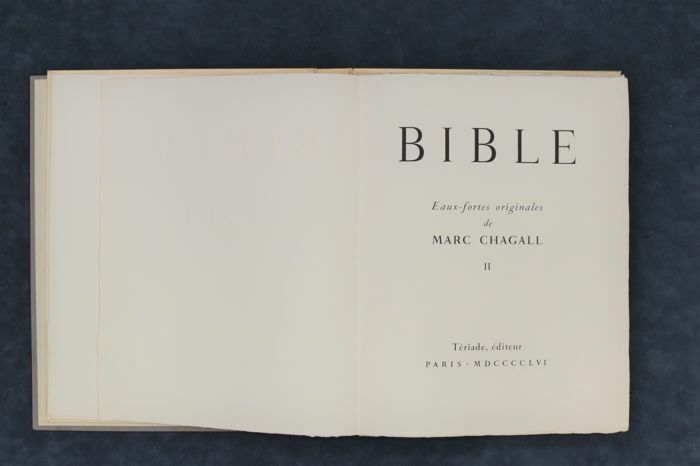 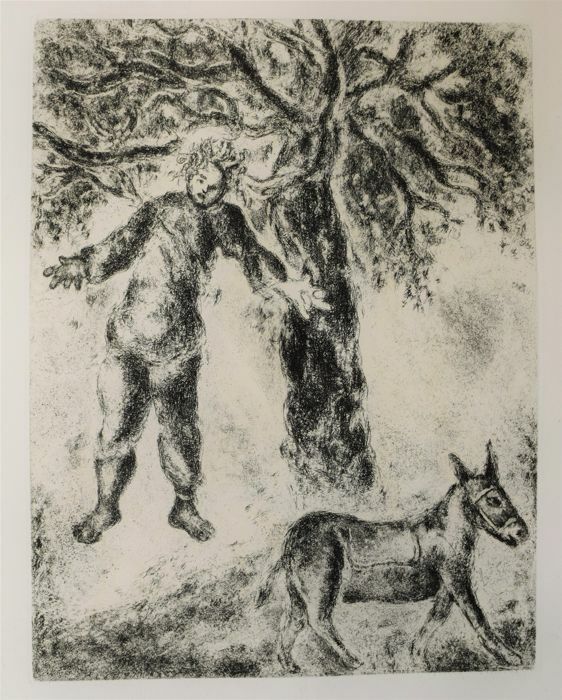 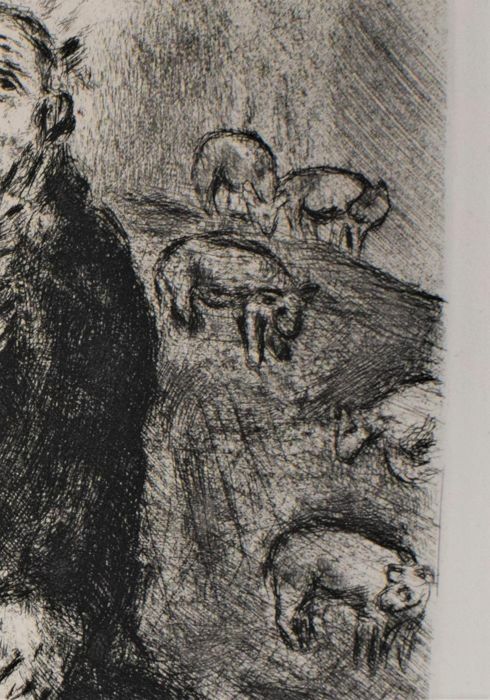 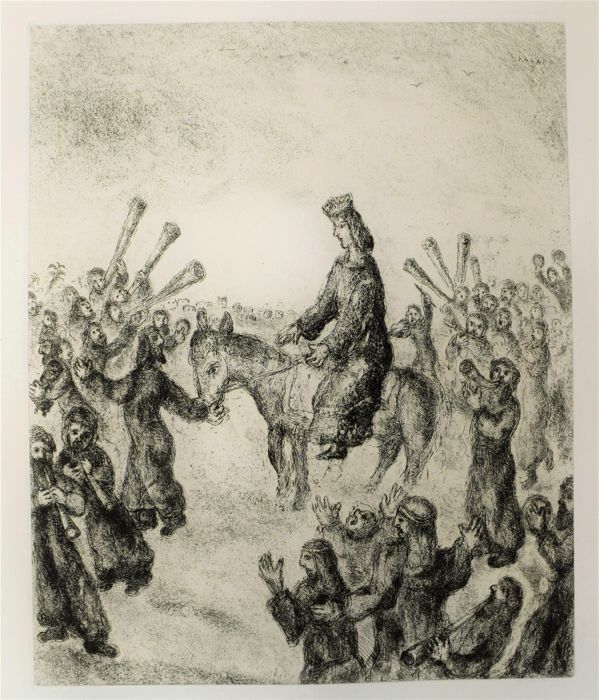 When the Bible of Chagall was finally published in 1956 by another publisher, Thériade, there were a hundred and five.